A 2990-g, full-term, baby girl with multiple congenital anomalies was born to a G4P2 mother. Three-dimensional CT reconstructions of the mandible (Figures 1, A and B) reveal prominent retromicrognathia. 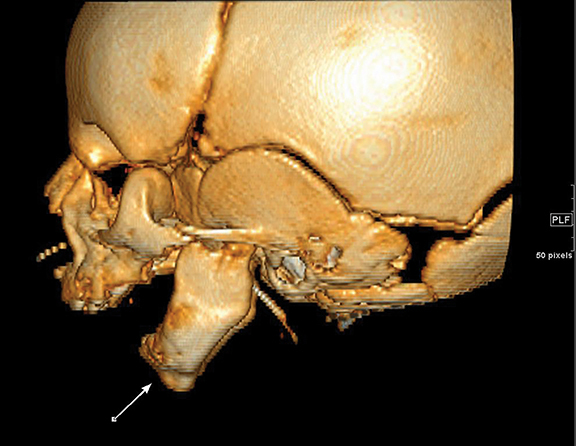 Note the zygomatic arch and external auditory canal are preserved. 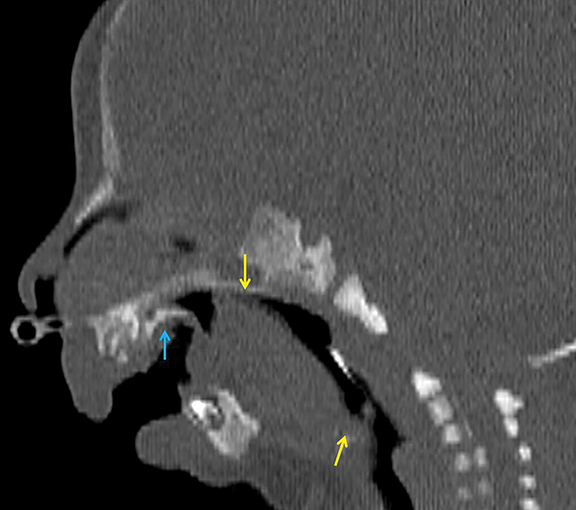 Sagittal NECT (Figure 2) demonstrates glossoptosis (ie, posteroinferior displacement of the tongue, causing obstruction of the oropharynx). The hard palate is shortened in length. The patient subsequently underwent glossopexy to advance the tongue. Axial NECT (Figure 3) shows U-shaped cleft palate. KUB (Figure 4) performed on Day 2 of life demonstrates three things: 1) segmentation of the posterior ribs with apparent pseudoarthroses; 2)10 paired ribs; and 3) age-appropriate bone mineralization. Differential diagnosis includes velocardiofacial syndrome (Shprintzen-Goldberg syndrome), Stickler syndrome, and Treacher-Collins syndrome (mandibulofacial dysostosis). Given their oropharyngeal abnormalities, children with the Pierre Robin sequence often undergo gastrostomy tube placement to meet their nutritional needs.1 In 2012 a Paris-based group published results of a longitudinal prospective study on children with Pierre Robin syndrome suggesting a good prognosis with no significant cognitive deficits but with diminished language skills.6 Eating behavior improved over time with only 6% of children reporting eating behavioral difficulties by age 6. 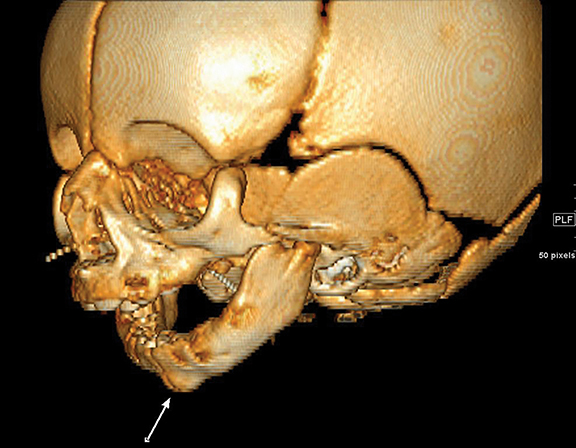 The Pierre Robin syndrome is a good illustration of the consequences of a single in-utero malformation leading to a series of anatomic abnormalities with several associated clinical manifestations. 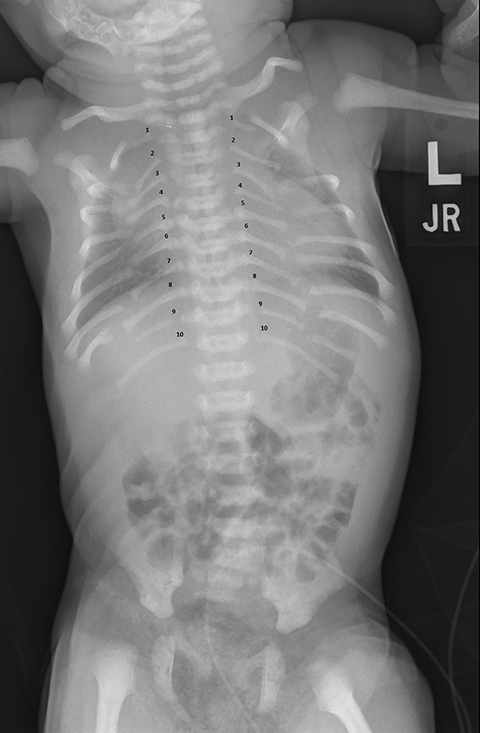 Early identification of retromicrognathia suggests that the clinician look closely for associated abnormalities and anticipate care needs with particular attention to feeding and airway needs. The prognosis of these children is good with no long-term cognitive deficits and progressive improvement of oropharyngeal feeding behaviors. Johnson J, Moonis G et al. Syndromes of the first and second branchial arches, part 1: Embryology and characteristic defects. Am. 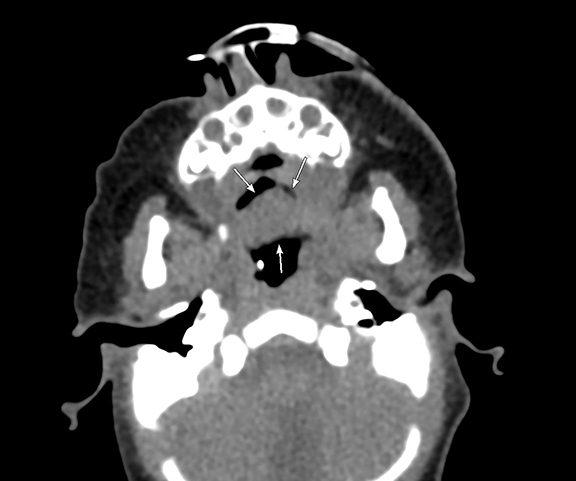 J Neuroradiol. 2011 32:14-19. Senggen E, Laswed T et al. First and second branchial arch syndromes: Multimodality approach. Pediatric Radiology. 2011: 41:549-561. Thouvenin B, Djadi-Prat J et al. Developmental outcome in Pierre Robin sequence: A longitudinal and prospective study of a consecutive series of severe phenotypes. Am J Med Genet. Part A. 2013; 161A:312-319. Evans K, Sie K et al. Robin sequence: From diagnosis to development of an effective management plan. Pediatrics. 2011: 127:936-948. Jakobsen L, Ullmann R et al. Pierre Robin sequence may be caused by dysregulation of SOX9 and KCNJ2. J Med Genet. 2007: 44:381-386. Al-Attar H, Shergill A et al. Percutaneous gastrostomy tubes in children with Pierre Robin sequence: Efficacy, maintenance and complications. Pediatric Radiology. 2012: 42:566-573. Pierre Robin sequence. Appl Radiol. Prepared by Dr. Sugi while at the Department of Radiology, Mayo Clinic, Scottsdale, AZ; Dr. Jorgensen, while at the Department of Medical Imaging, Phoenix Children’s Hospital, Phoenix, AZ; Dr. A. Towbin, while at the Department of Radiology, Children’s Hospital Medical Center, Cincinnati, OH; and Dr. R. Towbin, while at the Department of Medical Imaging, Phoenix Children’s Hospital, Phoenix, AZ.